Carrozzeria Orlandi is an Italian automobile bodywork, famous for the production of buses. The company was founded in Crespellano in 1859 by the carpenter and blacksmith Angelo Orlandi to build wagons and carriages. Soon, it became necessary to find a better arrangements than the original location of Villa Aldrovandi, moving into adjacent Bazzano, which was more spacious and suitable. in 1881, Angelo Orlandi moved to the city of Modena, where they were immediately acclaimed for quality and degree of finish of carriages and products. The following year, the city walls were torn down, which resulted in a flourishing season of development for public transport, tramways with new steam and animal means of propellant. Orders increased and the company was able to build and designed to your needs, including activating a branch town for the furnishing of horse-drawn omnibuses. The interest of Angelo Orlandi's children, Augusto, Enrico and Giovanni, toward the new mechanical and engineering, led to the construction in 1899, of the first Italian coachwork, on Bonacini trucks with 20 hp Bolide engines. They manufactured different specimens, but the bus won the gold medal at the 1901 International Automobile Exhibition in Milan in September that same year. They started the first experimental use of motor transport in the military during the maneuvers made by the Piacenza Brigade, completing the 110 kilometers stretch from Collecchio to Passo della Cisa, carrying a nine man tactician of soldiers and baggage. 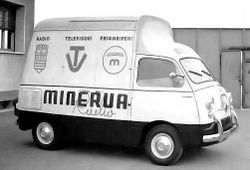 Carrozzeria Angelo Orlandi, located in Brescia (not to be confused with the Renzo Orlandi baised in Emiliano), had always been the preparation of specialized commercial and industrial vehicles such as coaches, trucks, ambulances and vans. Since the death of Angelo Orlandi in 1907, the Carrozzeria was handled by the three children who, in the same year, moved the company into a new place with more room a near the Ferrari Park . With the disappearance of Enrico Augusto, in 1921, was the cause of discord among the owners and the "Carrozzeria Angelo Orlando" was divided into "Carrozzeria Orlandi Giovanni" and "Carrozzeria Emiliana Renzo Orlandi", the latter headed by Henry's son. The two companies competed for some years, then the owners chose to sell the Carrozzeria Orlandi Giovanni at the Foundry in Vismara which transformed into "Officine Padania", with the same production. The Carrozzeria Emiliana Renzo Orlandi, however, continued the successful construction of buses, trucks and vans, but also valuable cars, however, this always remained a marginal production of Orlandi. In the '30s, cars were made of great formal elegance, intended for widespread use and popularity and increased by provision of vans for Scuderia Ferrari. During the Second World War, the factory was requisitioned for German aeronautics and, later, heavily damaged by Allied bombing. The Second World War saw a marked upswing of the business, along with the need to provide means of public transport, then decreased again with the increasing mass motorization the early '60s. In 1970, Angelo Orlando, son of Renzo, decided to sell a majority stake to Fiat and in 1988, sold gave the remaining 30% and allowing the incorporation of the Iveco brand.